As I write this article, I am sitting in a plane headed back to the Philippines from Mexico, a back-breaking 25-hour flight. I was in Mexico to attend a business conference for our company. I went about my business in my first three days in Mexico: a client visit, whole day meetings, nightly group dinners with colleagues, and lots of delicious authentic Mexican burritos and tacos. Finally, after three days of non-stop work, it was time to stop thinking of business and money – it was time to visit Our Lady of Guadalupe. I prepared myself for the next day’s visit to Guadalupe Shrine by prayer, reading of spiritual books, and a restful early night’s sleep. I planned to have a quick breakfast then head off immediately to the Basilica of Our Lady of Guadalupe, located just 20 minutes away from my hotel. Several of my colleagues were planning to go on a whole day tour and visit the Mexican pyramid – supposedly a beautiful, grandiose site and the third largest pyramid in the world. For a fleeting while the thought of joining them appealed to me – but just as quickly, I reminded myself that I had wanted to spend my last two days in Mexico not as a tourist, but as a pilgrim. And so I headed to the shrine of Our Lady. 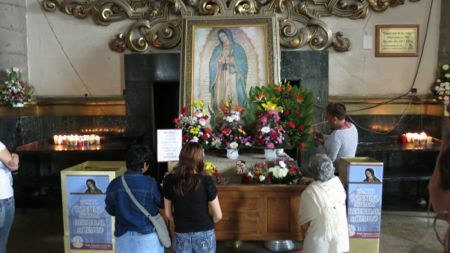 If Filipinos are called pueblo amante de Maria, or “a people in love with Mary,” the same can indeed be said of Mexicans. They are a people who truly love Our Lady of Guadalupe. My Mexican taxi driver had an image of Our Lady of Guadalupe on his dashboard, as well as a rosary hanging from the rearview mirror. 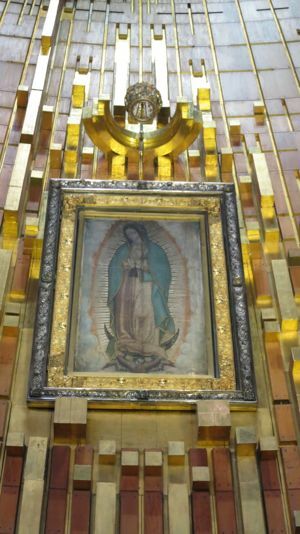 Images of Our Lady of Guadalupe were plastered on the entrances of many buildings and houses – similar to the images of the Twin Hearts of Jesus and Mary that are present on the entrances of so many Filipino homes. After a quick 20-minute ride that took me through the beautiful, tree-lined, wide avenues of Mexico City, I finally arrived at my destination: the Basilica of Our Lady of Guadalupe. Right outside the gates to the basilica was a long stretch of tiangge-style shops similar to those at the Shrine of Our Mother Perpetual Help in Baclaran. However, unlike the Baclaran flea market where one can buy a variety of items, the shops outside the basilica only had one product: Our Lady of Guadalupe. Pictures, calendars, statues, t-shirts – rows and rows of small stores all sold various merchandise featuring our Lady of Guadalupe. The new Basilica of Our Lady of Guadalupe. The basilica grounds form an enormous compound. It consists of many chapels, but the main highlights are the old basilica (the one originally built at the request of Our Lady) and a new, very modern basilica right beside the old one. In front of the two major basilicas lies a vast, open plaza where throngs of tourists and pilgrims mingle about. 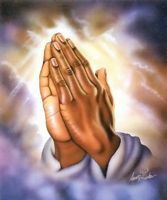 I saw a few Mexicans in the plaza “walking” to the basilica on their knees. At the end of the large compound is a large structure that includes a big clock and a small tableau just beneath the clock. Pilgrims and tourists gathered about the clock, watching a re-enactment of the apparition, as “performed” by statues of Our Lady and Juan Diego. As I went inside the huge, cavernous new basilica for the first time, I was immediately overwhelmed by its sheer size, as well as by the huge throng of people inside. It was a Saturday morning, and yet the huge basilica was full of people attending Mass which was being celebrated at the time. Thousands of pilgrims fill up each and every Mass, which is celebrated hourly starting 6:00 in the morning to 8:00 in the evening, every day of the year. Each mass starts exactly at the beginning of the hour and is timed to perfection. 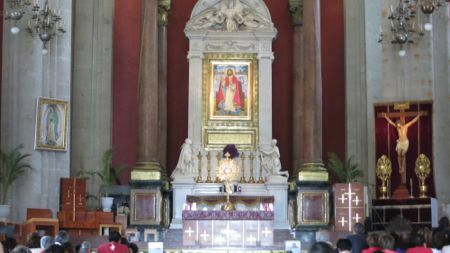 I spotted the original tilma – it was located at the huge altar of the new basilica, underneath a large cross, a few meters to the back of the priest’s chair. I made my way through the crowd of people and got to the closest spot possible. Still, because of the sheer size of the basilica, I was still a good 40 meters away from the tilma. I was happy to see the tilma, but was admittedly mildly disappointed at not being able to go as close as I would have wanted. I had imagined seeing the tilma just a few meters away while sitting in front of it and praying in silence, contemplating the miracle that it represented. Alas, it seemed that it was not to be. I had to content myself with a 40-meter view of the tilma, and with my bad eyesight it was like looking at a small picture frame from a long distance. Even my camera did not cooperate – I only had a small one which did not have a good zoom lens. 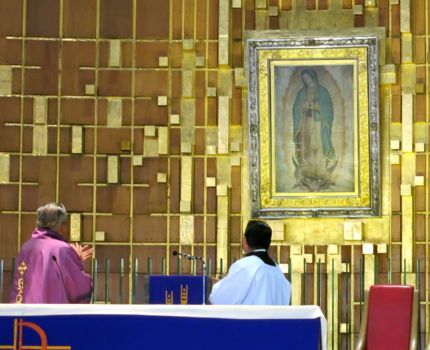 The Mother always leads us to her Son - in the old Basilica of Our Lady of Guadalupe, when Holy Mass is not being celebrated, the Blessed Sacrament is usually exposed for veneration. Since mass was ongoing, I bade the tilma “goodbye” and proceeded to the old basilica. The old basilica, smaller than the new one, echoed with beautiful chants of “Santa Maria, madre de Díos...” The rosary was being recited non-stop. The Eucharist was also exposed. As I sat in prayer in front of the Eucharist, I finally felt the deep peace I was looking for in Guadalupe. It was a deep peace borne out of much silence, amid the beautiful incantations of the “Hail Mary” recited in vaguely familiar Spanish. I prayed the rosary and there I realized what Guadalupe was really all about. It was a place of much prayer – non-stop prayer. Non-stop Holy Mass, non-stop exposition of the Blessed Sacrament, non-stop rosaries, non-stop confessions... And there, on my first day, Our Lady led me up close, not to the tilma but to Jesus Himself in the Blessed Sacrament. Mary, first of all, leads us to Jesus. At around noon-time I attended Mass in the old Basilica. All the masses were in Spanish, and yet despite that, I felt right at home. Thanks to modern technology, I was able to follow the readings through the missal application installed in my iPhone. 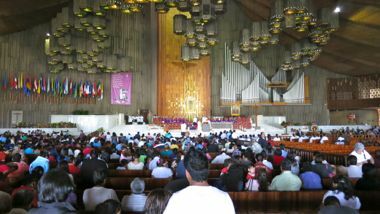 The Mexicans were active in their participation in the Mass. Responses were loud, people joined in the singing. During the “Peace be with you,” everyone greeted each other - not with a passive nod like in the Philippines but with a firm handshake. 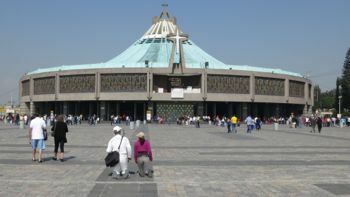 Holy Mass is celebrated in the new Basilica of Our Lady of Guadalupe every hour - every Mass is full without exception. The end of each Mass in the new Guadalupe basilica is a most beautiful experience. Right after the final blessing, the priest faces the original tilma of our Lady, kneels down, and leads the entire community in prayer. It is a long prayer, led by the priest, and joined by the entire community. After the prayer, the priest stands up, faces the crowd, raises his fist in the air, and shouts: “Viva la Virgen de Guadalupe!” The entire crowd erupts in response, filling the entire basilica with a deafening roar of “Viva!” This is done three times, after which the final hymn begins playing and the priest makes his way down the altar. 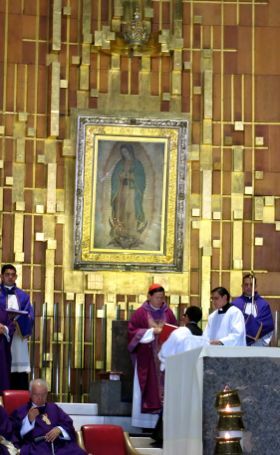 Every Mass in the Basilica of Our Lady of Guadalupe ends with a tribute of "Viva la Virgen de la Guadalupe! ", led by no less than the presiding priest. The last hymn is a familiar one – it is “Daily, Daily, Sing to Mary,” so common in the Philippines, but in Guadalupe, it is of course sang in Spanish. I listened with nostalgia. I play the organ in my parish in the Philippines and the song is one I know only too well. Almost the entire congregation knew the song. I couldn’t help but feel a twinge of sadness – I was told not to play any Marian song during the entire season of Lent. There may be a liturgical basis but it made me wonder: why is it that here in Guadalupe, during this season of Lent, every Mass ends with a Marian song? Here in Guadalupe, it is the priests themselves who lead the community in praying to Our Lady of Guadalupe. At the end of each Mass, they kneel down in front of Our Lady and lead the community in prayer. 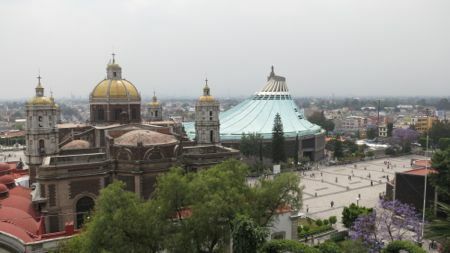 The old and new Guadalupe Basilica, as viewed from the top of Tepeyac hill. After the Mass I went up little Tepeyac Hill where Our Lady first appeared to Juan Diego. A mass of pilgrims was going up and down the wide stairs that spiraled up to the top of the hill. The top of the hill had a breathtaking view of the whole Basilica compound. I entered the little chapel perched on top of the hill. 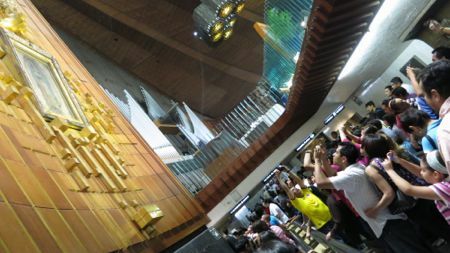 A television screen was set up inside the chapel, playing the movie “The Passion of the Christ.” The movie has never failed to give me an emotional, spiritual jolt, and I wasn’t alone – many pilgrims watching inside the little chapel were silently in tears too. At 3:00 in the afternoon, a Mexican started to lead the little congregation inside the chapel in reciting the 3 O’clock Prayer and Chaplet of Divine Mercy in Spanish. They recited many other prayers after that, interspersing it with songs. I spent the entire afternoon in that little chapel, soaking up the peace and the simple joy of solitude and prayer. Up close with the original tilma of Our Lady of Guadalupe. At around 4:30, I went down the hill, with the intention of looking for a store where I can buy some souvenirs. I went inside the new basilica, and found the store through a hallway that led towards the back and underneath the main altar of the basilica. I noticed that pilgrims were going to and fro an entrance that was located near the store. Curious, I followed the people inside. I saw a “walkalator” where people stood, moving like a little procession – and all the while, looking intently at the same exact spot on top. There were people on their knees on the ground praying intently. Some were crying. All were looking at the same spot. And lo and behold, I saw the tilma. We were “underneath” the altar, apparently, and through an open ceiling, pilgrims could look up and see the tilma just a few meters away while standing on the walkalator. I was overwhelmed with emotion – it was such a beautiful surprise. Our Lady had apparently reserved the best for the last – the holy tilma, the miraculous tilma that Our Lady herself had imprinted on Juan Diego’s tunic hundreds of years ago, was right there, just a few meters up. The joy of seeing the tilma up close simply cannot be described. There is a special joy in the encounter – a feeling similar to what I had when I saw the grotto in Lourdes for the first time, or when I saw Pope John Paul II pass by during World Youth Day. It is a deep joy that can only come through a great gift of grace from God. The only regret I had was that I was all alone in Guadalupe. My wife loves Our Lady of Guadalupe and considers her as her patroness, particularly for giving us the beautiful children we now have. How I wished I could go back there and bring her and my children! 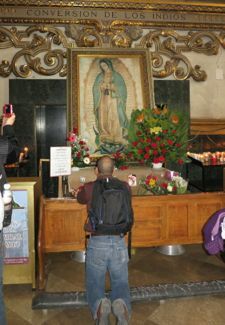 The essence of a pilgrimage to Our Lady of Guadalupe - is prayer, non-stop, prayer that gives true peace to the heart. Guadalupe should not be regarded as a mere tourist spot. For a simple tourist, a quick 1-hour visit to the basilica will do. Lourdes is much more scenic, with its lush greenery and sprawling compound. Guadalupe should be regarded as a place of prayer. My trip to Guadalupe was like going on a retreat – it was a time for prayer, contemplation and solitude. Guadalupe gives a beautiful sense of peace and joy that cannot be given by even the most breathtaking tourist spots in the world. My Guadalupe Pilgrimage was a time to once again feel the presence of the Mother in my life. In the daily grind of a life spent mostly at work, it was refreshing to simply “disappear” in the loving embrace of Mary, placing all my worldly cares and concerns at her feet. "Am I not here, your Mother? Are you not under the shadow of my protection? Are you not in the hollow of my mantle? Are you not in the embrace of my arms? What more do you want?"